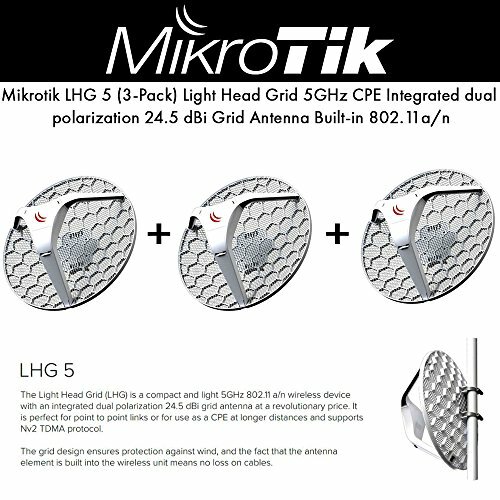 Mikrotik LHG 5 (3-Pack) Light Head Grid 5GHz CPE integrated 24.5 dBi grid antenna PoE 6W by Mikrotik at Pacs BG. MPN: RBLHG-5nD. Hurry! Limited time offer. Offer valid only while supplies last. The LHG is a compact and light 5GHz 802.11 a/n wireless device with an integrated dual polarization 24.5 dBi grid antenna at a revolutionary price. View More In Network Antennas - Page 2. The LHG is a compact and light 5GHz 802.11 a/n wireless device with an integrated dual polarization 24.5 dBi grid antenna at a revolutionary price. It is perfect for point to point links or for use as a CPE at longer distances and supports Nv2 TDMA protocol. The grid design ensures protection against wind, and the fact that the antenna element is built into the wireless unit means no loss on cables. If you have any questions about this product by Mikrotik, contact us by completing and submitting the form below. If you are looking for a specif part number, please include it with your message.